Vision Without Obstruction: What We Learn From Steve Jobs by Scott Belsky in The 99 Percent, he reflects on Steve’s unyielding focus and points out some unique aspects of his personality that were his greatest strengths. This is apparent in the quality of products that Apple delivers. Yes they are expensive compared to their competitors, however they are never a disappointment. They just work. The superb form factor and consistent operation of their products is a result of never giving in and settling for less. These “demons” resonate strongly with myself. I understand the pressure each play on my decisions daily. There is alway the urge to compromise and make things easy for the moment, however, keeping the long-term vision in mind and making sure that that vision drives every decision (even compromise) is a talent at which Mr. Jobs excelled. His own words and actions truly convey the notion of live life to the fullest. Don’t worry about what you think others would want you to do. Just do what you know is right and good to do. You can never be sure you know other people’s motives for what they want you do to, but you can know your own. If you follow your own vision you will succeed. Even with failure, you will not lose, you will gain experience and confidence to try again. If Jobs gave up on tablet devices with the Newton, we would have an entirely different tablet market today, if we would have one at all. The most important factor in Steve Jobs success is his clarity. Clarity of vision, motives, and purpose. Having clearly defined reasons for your actions. Having thought out what matters and making sure you don’t lose site of what matters while moving toward your goals. It sounds so simple when said, but in practice, there are so many things that get in the way and distract us from our purpose. If we focus on what matters to us (our passion), we will have that clarity and can accomplish great things. I have been doing a lot of training in the last month on how to utilize Promethean boards in an “interactive” way. This is what administrators tell me they want. Most administrators have never taught with one so I always end up asking them to more clearly define their expectations. Usually they put it on me to define what interactive means. 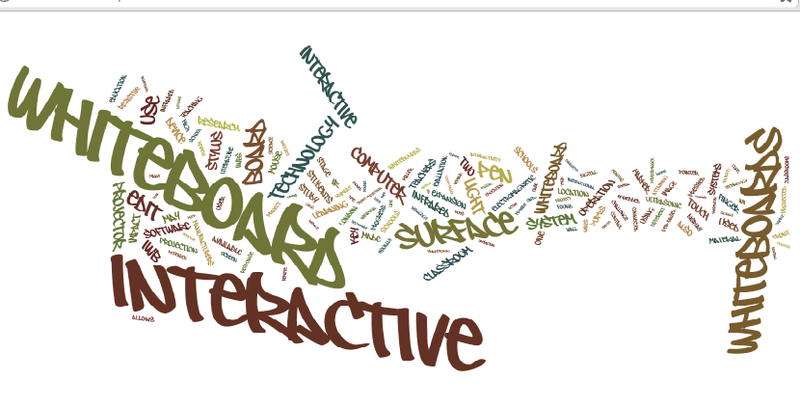 Interactive whiteboards are creation tools! The educational expectations of the 21st century places creativity at the forefront. IWBs and the software that goes with it allow amazing creativity for the teacher to model and students to engage in as well. The trick here is to simply give students time at the board and time to create with the software. Interactive Whiteboards and the software allows for collaboration! Another 21st century skill is that of collaboration. Collaboration works best when people share. I see this happen every day in my district’s Yammer network, at sites like Promethean Planet, and within schools as they meet in their Personal Learning Communities (PLCs). Sharing resources allow others to use what you’ve created and adapt it to their needs. Now how do you apply this to the classroom and get student’s creating and collaborating? Two words, file sharing. Using a wiki, dropbox, or any other file sharing service, give students access to presentation files. Assign them to upload segments of the presentation. Have them critique aspects of the presentation. Have them find presentations on a particular subject and then evaluate it on specific criteria… the options are limitless. What’s more is true content creation and collaboration involves an intense amount of critical thinking! I’m inspired to write this blog today from a podcast that I listened to this morning (Enough- The Minimal Mac Podcast). In the episode they were talking about twitter and discussing the urgent need to share in Twitter. In this dialogue one of the hosts mentions he feels a responsibility to share information he has. It was a brief comment and the other host didn’t even comment; it was as though they both thought it was too obvious to even reinforce with affirmation. That comment got to me because of where I am currently in my own experiences with teaching and collaborating with other teachers. I have often found myself frustrated with the hoarding of information… of not sharing. Teachers are expected to collaborate, just search any state teacher evaluation document for the words collaborate, share, and communicate. It’s there! But it seems that teachers have difficulty doing it. Don’t get me wrong, I understand that collaboration is a difficult task. I find myself struggling with it all the time. It is easy to assume that it would be easier to get the job done on my own, however that approach misses the point that true collaboration results in more than any one contributor could achieve on their own. It is a case of where 1 + 1 = 3. The synergy of different ideas filtered through lenses of different experiences open possibilities that would never have been discovered. What concerns me is that mandating collaboration isn’t really the final solution to the problem. Educational leaders and policy makers can mandate that collaboration happen, but in the end it is up to the individual to realize their responsibility. Before anyone will accept a mandate to collaborate the way they are expected to, they need feel a sense of responsibility. We teach, because we should. A teacher is a master learner. We learn, we see a value in others learning what we learned, we create opportunities for others to learn. A true passion for learning would manifest itself in sharing what you learn so others can learn too. This is easy to see when you consider the excitement that even the most introverted individual can express when you hit on a topic that interests them. Conversation can be an opportunity to share what interests someone the most. Things that interest us, cause us to want to spread that interest in others. A teachers interest is learning. If learning is your passion, then sharing what you have learned is motivated by a sense of responsibility. So what does this mean for new standards and teacher evaluations that set expectations for sharing? A mandate will not create a sense of responsibility, but it can inspire reflection, conversation and shift focus to a frequently undervalued area of the educational community. As we look at 21st century skills in education, there is a lot of emphasis on making sure students are utilizing webtools and concepts. Approaches to content creation like blogging, digital storytelling, and content remixing are being merged with collaboration and organization of that content through social media services like Facebook, YouTube, Diigo, wikis, and many others. But why are we emphasizing this in education? I believe it comes down to two good reasons. 1. These tools make if possible for self expression and learning from other’s unfathomably more efficient than without them. I know it sounds strange to say that the internet is efficient. I have watched it become the biggest distraction to my productivity. However, if I control my urge to look further, and focus on what I am trying to accomplish, I can achieve what would have taken many trips to the library, a spiral notebook, a pack of index cards, and a lot more focus than I need on the interent to complete. To me, this advantage alone makes webtools invaluable. The only way someone truly learns and retains a concept is to make it their own. Apply it to their lives. Reflect on it and demonstrate how it is of value to them. Webtools make this possible and allow the learner other dimensions of freedom to explore and interact with content. 2. There is an economy building out of webtools and internet marketing. I’m undecided on if all students will really need to be bloggers, tweeters, and web content creators in the workforce of tomorrow. It sounds a lot like the myth at all students need to go to college. What I do believe is that all successful businesses will need these skills in their workforce. Having a web presence that is promoted and curated by creative people is already an identified need by most businesses. The skills of creating content and then organizing it on the internet are already identified by businesses as their product (content) and what is referred to as Search Engine Optimization (SEO). And that outsourcing is going to be done, we hope, with the students we are teaching today. Curatorship: Individual Responsibility or Job of Expert? Thank you Brian Eno for presenting the obvious before anyone else discovers it. I hope we all find curatorship skills and utilize them more effectively. Organizing information and being able to find it later is going to be key. Though I disagree with the statement that it is the next “big job”. I envision a world where anyone can curate content and do not need to rely on “experts”. This task is big but if everyone is a curator, then the task is possible and information remains free and vast. If we delegate curation of content to a select few experts, we will remove ourselves from knowledge and again be relying on others to control what we have access to. This is a commonly used argument for restricting access, utilizing resources that will curate information for our selves or our students. The trouble with these kinds of metaphors is that people start to actually immagine that the interent is a fire hydrant and that it is “impossible” to find the information you want to “drink”. Yes there is a lot of information, but we all can be taught skills that allow us to dip into the stream and get just what we need. Just like a fireman or a plumber have tools that enable them to modify a fire hydrant’s stream to get a drink, we need to know the skills to modify the interent to meet our needs. Are Twitter, YouTube, and Blogging for Educators? In the last month I’ve spend a lot of time discussing the relevance of webtools in learning. Tim Smith and I have been presenting on 21st Century Learning Skills and Tools throughout the Charlotte Mecklenburg School District. We’ve spent a lot of time discussing the infographic: “What Happens Every 60 Seconds on the Internet“. There are a lot of interesting numbers thrown out in it, but as we presented today, I found myself questioning just how relevant are these numbers to educators? So I pulled some data, made some educated guesses, and did a little math. My work is the remainder of this blog. Feel free to use this information the next time you are asked “why do I need to use are even know about Webtools? Educators make up a fraction of the country… what is that fraction? As of the 2008 census data: approximately 1% of the US population are K-12 teachers. Now let us assume that one in ten teachers are contributing content to Twitter, YouTube, and/or Blogs. That makes 0.1% of the US population is contributing educational content rekevant to K12. So we take that 0.1% and apply it to the 98,000 Tweets and find that there are likely to be about 98 educationally relevant Tweets occuring in just one minute. It may take two minutes for a relevant YouTube video to post and there would be 1.5 blog posts. So you may step back and say, but there is more than just the US contributing to these tools. To which I say YES! There are! But there are also more than just US K12 educators contributing. When you consider that most developed countries are likely to use these tools and typically have more than 1% of their populations teaching at the K12 level, my data comes off quite conservitive. Now lets expand that to a day. In one day you will see approximately 140,000 educational tweets! 860 YouTube videos and 2200 blogs! That is a lot of content. Even if you want to be pickey about the quality of the educational content and demand relevance to your particular facet of K12 and say only 0.1% of the education content is relevant to your specific interests or 0.1% of 0.1% (1 in 10,000 posts), you would still find over a thousand Tweets, about 9 videos on YouTube, and 22 blogs in one day! As educators, we are finding the pressure to be part of many different social media products. “You should be on Twitter”. “Not on Google +? I’ll send you an invite.” Administrators look at the current mandates for Technology in the classroom and the vaguely defined 21st Century Skills and they start making teachers feel judged because they are not using a specific WebTool. This all builds into a frenzy of account creation in order to stake a claim on every Webtool the moment you see it in your twitter, rss, or Diigo feed. It is like a Zombie epidemic where once bit, we mindlessly seek to chomp on the collaborative consciousness of web tools! And like a Zombie we become consumers*. It doesn’t have to be like this though. Like any survivor of a Zombie plague, you must prepare yourself. Make decisions and have a plan before engaging with the virtual world. It is essential that you determine your mission/objectives. Tim Smith (Technology_Tim) and I have spent a lot of time discussing our own personal missions for web tools like Twitter, as well as our professional missions in CMS Instructional Technology. Like most people, I believe we started out Zombies. I spent much of my time aimlessly navigating Twitter feeds and reading Diigo posts and finding a lot of my time being sucked away with little virtual nourishment. Just like zombies with brains, once I started creating a profile on that site… I crave the next one. But I wasn’t really doing anything more than finding the next tool. There was no time spent learning how to use it effectively because someone suggested the next tool and I was off. With out defining my purpose for being online I was just joining sites and suggesting that other’s do the same. No matter how you find yourself creating an account for a web tool, you need to begin with asking yourself, how will this tool help you fulfill your mission? If you see it can, then define how much of your efforts you are willing to focus on it. If it can’t, walk away from it! This site is laden with zombies and you have little chance of getting out of it alive. This is an important exercise. Without it, you wander aimlessly following the ambitions of others. Before you know it, you’re infected with a severe case of social media overload. Of corse you could just chose not to participate in the digital revolution and wait for someone to force you into a particular site. But then, is that the same a just letting yourself get bit by the zombie? *Zombie brains are without value. Other zombies won’t eat a Zombie brain. In fact, the Zombie brain is what must be destroyed in order to stop the zombie invasion. In the last several months, Technology_Tim and I have explored services that will give us analytics about traffic to our wikis (Google Analytics) and involvement in Twitter (Buffer, Twopcharts, etc.). There has been a lot of data to look at from these services and it has been an extremely time consuming experience quite often. It gets to be quite exciting to look at charts of traffic to a particular wiki and then dig deeper to see what browser the viewer was using or what State or country they were from. We’ve also spent a lot of time researching how particular Tweets and the timing of those Tweets affect the amount of hits on a link and retweets. This experience has been entirely a side project built out of our own curiosity that is quickly becoming a standard expectation for any new web tool we are assessing. The thing is, most web tool are building analytics into their site or are allowing other services like Google to put analytic code into them. Why? As the infographic shows, market research is at a point where every user is a significant data point. Markets understand that customization is key. The only way they will be able to get there is by getting as much information about the user as possible. 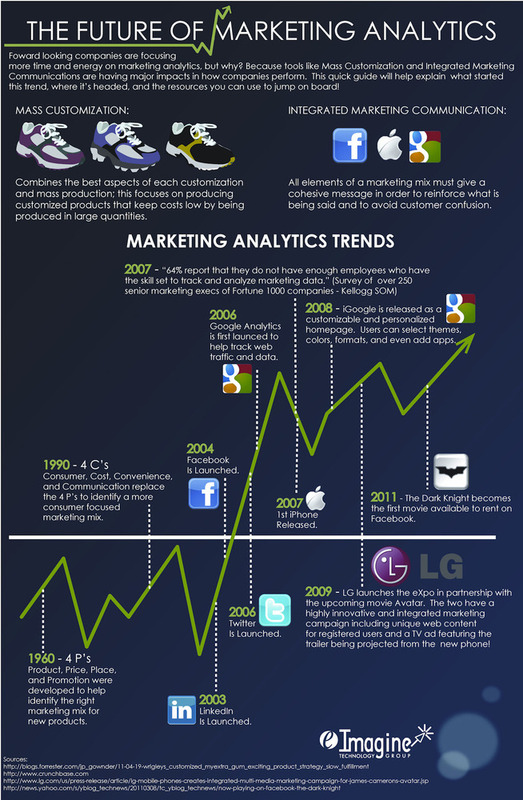 With analytics technology today, so much information is possible. What I am seeing is a need to teach analytics in our schools. As a science teacher, on of the most lacking aspects of the lessons was relevant, interesting, and inspiring data. The students would usually need to spend entire class periods in labs before we’d get much data that requires significant analysis against a hypothesis and formulation of conclusion. Now website analytics won’t give us data on laws of thermodynamics, but it will provide relevant, interesting, and inspiring data for students based on their interests. They can compre the activity of twitter accounts for news programs or reporters. They can track the access to their website (wiki, blog, etc.) and see how adding key words or particular sharing techniques give them more access. I could argue that this is necessary as a tool to help them get have a web presence because web presence is important in the 21st century… but I would rather argue this is necessary because they need to analyzing skills that apply across any curriculum. To be a critical thinker, you need information to think about… analytics are amazing tools for this. “Know when to read at a pace of 100 words per second, 10 words per second, 1 word per second.” I wish I could remember the name of the person I’m quoting here. He was a professor at Michigan State University that I never took a class with, but I still remember the advice. This advice was given at a book study for my Freshman orientation as we discussed Frankenstein. The internet was still very unfamiliar to me. I didn’t even have my student email account yet. But this advice seemed important. I was only starting my education in Biochemistry. All those textbooks to read and journal articles to analyze for relevance to what I was researching. It was going to be a time where I needed to go through so much information that it seemed obvious that I needed an efficient method to get to the relevant information and still have a life. Is this skill useful today? Today the internet is much more matured and the amount of content that can be explored and analyzed has exploded to unfathomable proportions. Universities are digitizing their content, people are demanding e-books they can obtain without ever leaving their home, and every individual has the ability to create their own content to post it to the internet with a simple creation of a free user account on any number of blogging services. How is anyone going to be able to get to the information they need? By knowing how to aggregate, skim, read, and analyze. (I’m using these three terms in place of reading at 100, 10, or 1 words per second because numbers are literal statements.) Let’s start with the goal in mind; How do you intend to use the content you will spend your valuable time finding? If you don’t have a plan at the beginning, you are going to be consuming a lot of information, but get nothing out of it. It is like cramming for an exam the night before. Sure you recall it all for the test, but will you remember it a week, month, or year from now? Aggregate: To start with, we need a way to let the computer find sources that generally give good information at least some of the time. Though this process can be automated, it is important that some thought is put into setting it up. There are many aggregators and methods to using them out there. One that is often under appreciated is Twitter. There are several ways this can be done, however simply following people that share information relevant to your interestes is an amazing start. It is important though that you follow people that provide relevant information (for more on that, read my post: What Does Your Twitter Presence Say About You?). RSS feeds are another method to find information. Google reader is a powerful aggregator tool. Simply enter your search term in http://www.google.com/reader and it will find the RSS feeds for you. Skim: Once you have information collected in whatever source you are using, then you need to weed out all but the most relevant information. This requires quick decision making. Read through the headlines, tweets, email subject lines quickly and make an instant decision on weather it is worth you time. You will likely throw out 10 or more information sources for every 1 good one. This process can be liberating, but you have to not worry about something getting lost in the process. It’s the internet… it will come back. Read: Now that you have determined the information that may have potential, you need to actually read it. In this process you may discover that the content does not match what you thought the title/subject described. Or perhaps the writing isn’t easy to follow. Don’t worry, that article isn’t the only one you will ever see on the subject. You don’t have to torture yourself because your skimming wan’t perfect. In those cases, you throw more content out. Analyze: Now with any luck you are less than an hour into your process and have a handfull of content sources that you have found relevant. Now is the hardest part. You need to analyze it. How are you going to use the content you have spent your valuable time finding? If you think about this question from the beginning, this process will be much easier.